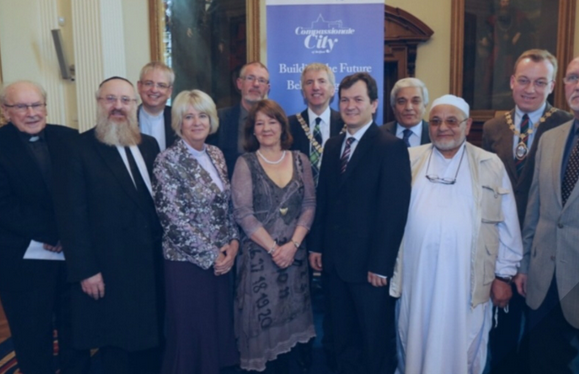 It was high noon with a difference on the 2nd of June 2014 in Belfast City Hall-- the difference being that Belfast City was to engage in developing and promoting and above all engaging in the international Charter for Compassion, as everyone prepared for the launch of Compassionate City Belfast. The Mayor Máirtín O Muilleoir welcomed all in attendance to the launch and informed everyone of his hope for a compassionate Belfast. Compassionate City Belfast committee directors were in attendance and were filled with a sense of awe at the launch of their dream that they had been involved in creating over the last year. They are Mary McManus, Heather Mcgregor, Rev Bill Shaw and Frank Liddy. threshold of a new dawn. Emails of support were read out from Marilyn Turkovich programme director for Charter for Compassion and a beautiful poem written by another committee member, who unfortunately couldn't be present, John Paul Lederach, the poem reads as follows. As you wish to be noticed. With all those who cross your path, known and unknown. To the pulse of humanity that walk them daily. It is not so new you know. Poetry streets some called them. Clicking, clacking back street jelly roll. The little and the lot. The charter was then signed by the Lord Mayor Máirtín O Muilleoir, his Belfast City Chaplains and later by all those present. Everyone was informed that this is the beginning of a compassionate conversation that will engage the city of Belfast, in a dialogue of hope, love, respect, and dignity. As he prepared for his final act as Mayor of Belfast City launching his Compassionate City Charter Councillor Máirtín Ó Muilleoir along with Sinn Féin President Gerry Adams TD take time out to reflect on his year long term as Mayor. Learn more about Compassionate Belfast and one of its organizers on the TED Prize Blog on this website.